Our guests have great holiday in Spain in our Club Villamar holiday homes! Just like you, they're happy, honest and critical. And they're eager to tell you their experiences. From the moment they started searching for their holiday villa, till the last amazing moment of their holiday. Of course, also our guests wildest moments can't be missed! I bet you're curious about our guests opinions and how they found their great holiday home. Watch and listen to some of the holiday anecdotes of our guests explained with their own words. And of course watch how our guests are doing during their stay in one of the Club Villamar holiday homes. Yeah, you got this right: You're about to discover several holiday homes on video!! And now... let's check 'em all!!! map how to get there. per person and we came with our own car. The site was very good. It was well organized. You could search with a lot of search options. Which made it more easy to find. I've already been to Salou in an apartment. we wouldn't book again with Club Villamar. a villa in the area of Lloret with Club Villamar. it's mentioned on the site. 3 years ago we went with 12 of us to Blanes. pool, airco, bathrooms and kitchens. diner. And we like to go a day to Barcelona. something's up they come immediately. knew we wanted to go to Lloret de Mar. a big villa, beautiful, colorful. public places, it's not bad. so it wasn't that expensive. buddies, also for young people like us. just a search on google for a villa in Spain. We got the link for Club Villamar. also people who just want to lie on the beach. of good weather and it's not too far away. important after a day on the beach. own pool. It's also a good place for families. the water park or a day tour to Barcelona. I mean you see the pictures. It looks all good. I think the service of Villamar is very good. I have a good holiday! design. The villa is suitable for families. reality and the price/quality is very good. Brava' and 'large house with swimming pool'. any further, because we liked it immediately. many employers that speak French perfectly. bedrooms, swimming pool, terrace, barbecue. The villa is large enough to live royal in it. floor you have rooms and bathrooms. so lovely to swim in. call you whenever we want. This is a plus. They were very helpful and patience with us. who want to enjoy a peaceful holiday. the right desision to choose this villa. also with Club Villamar. The villa is beautiful. but for families it's also very functional. very nice and there is a beautiful beach. Blanes and Tossa de Mar. It was a very good experience of 15 days. Club Villamar didn't disappoint us. at the website of Club Villamar. we came across this. It was perfect. but our last week we want to relax. was exactly as is shown on the site. We recommend this villa for families. somewhere that isn´t too far from Barccelona. Next year we want to come back to Spain! We searched in google for 'rent villas in Spain'. a good destination, because France is nearby. the search engine 'villa in Spain'. wanted and a large choice of villas. was so large! W're super happy! to take a villa here. we phoned, they answered our questions. we found this villa with pool for a lot of people. parties and music in the evening. Therefore it's also a good place for families. We went to the beach and to Waterworld. advantage of the villa. It has a nice view. For families it will also be perfect. We typed villa Spain (...). good, this was exactly what we wanted. surprise when we arricved at the place. We would recommend the villa to family. organized, we have no complaints. We found this villa on the internet. We thought it was not bad and chose it directly. stay in a villa with pool. we saw on the website of Club Villamar. we have enough space, it really is a holiday villa. 'villa in Lloret de Mar'on google. said we wanted a swimming pool, this is ideal. beach, not far from the nightlife. everyone speaks French, thehospitality is perfect. Lloret next year. 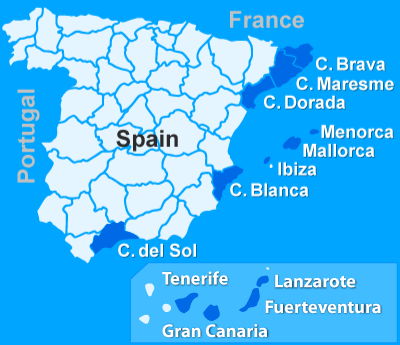 Spain is also close to France. Ramblas. We had no problems. part of the big partys in lloret. transparent. We had no worries. the old town which is very pretty. to go on holiday with a lot of people. it's even better than on the photos. a games room where you can have fun. makes it very nice and there's a garage. and the beach is nearby. Everyone will enjoy this villa. year we will definitely search on this website. the first link that showed up. different villas and we chose this one. no surprises on things to pay extra. of us went to Lloret before. looked on the site. We found this villa. everyone, good value for money. to others. We can do some sports here. youngsters is the distance from the nightclubs. Club Villamar thank you for the help! It's difficult to find a villa for youngsters. everything we came across several things. Place, pool, near the city but nice and quiet. The beach is not very far either. (…) the price was the most important. Because it was raining everybody came. And Spain is nearby, as it's at the border. Activity (...) the beach, Aquapark, Barcelona. Have you checked some of the videos? Already longing for that nice cocktail on your own terrace or a refreshing dive in your swimming pool? Nice, huh? Get into the summer holiday mood. It's easy and simple to find your suitable holiday home. 1. Click on the name of the villa next to the video to see the details about that holiday home in particular. 2. Click on the yellow/orange button below and start using the searcher. You can refine your search results by marking, for example, the area or specific facilities you want. "like" us on Facebook to get more exciting pictures and videos, and to check our posts and comments. Not without a reason, we've got already more than 20.000 ¨likes¨!